Winnie the Pooh has been given a new assignment - to provide special comfort and friendship for young children during their hospital stays. Build-A-Bear Workshop has joined up with Disney to send out thousands of make-your-own Winnie the Pooh bears that will be sent to hospitals across three countries. The initiate is being organised by Starlight Starbright Children's Foundation. The charity is dedicated to providing entertainment and education to ill children. Winnie the Pooh would be really proud to helping kids through bringing together families and making them smile. 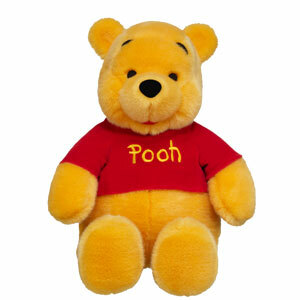 Every time a customer creates their own Winnie the Pooh bear at a participating Build-A-Bear Workshop, they'll be given the option of sending another one to a hospitalised child, completely free. It's also a perfect way to the cele-bear-ate the 80 years that Disney has been creating Winnie the Pooh magic. The special make-your-own bear retails for $20 and can be made at any Build-A-Bear Workshop, or online at BuildaBear.com. The bear is 17 inches tall and has yellow fur and red t-shirt. The promotion runs in the United States, Canada and the UK. It will end on June 30th. Additionally, you can support the program by donating via PayPal's Text to Give system. Simply text STAR10 to 78787. Each year, Disney's Outreach program donates more than $170 million.